Runner-up in the inaugural Breville Latte Art Smackdown at The Rocks Aroma Festival on July 27, Jordan has been working with speciality coffee for three years. “I’ve been a full time barista, working with specialty coffee for only three years now so I'm really still a baby, however I'm extremely passionate about the coffee industry and I'm constantly pushing myself to learn more every day and share my knowledge with customers. 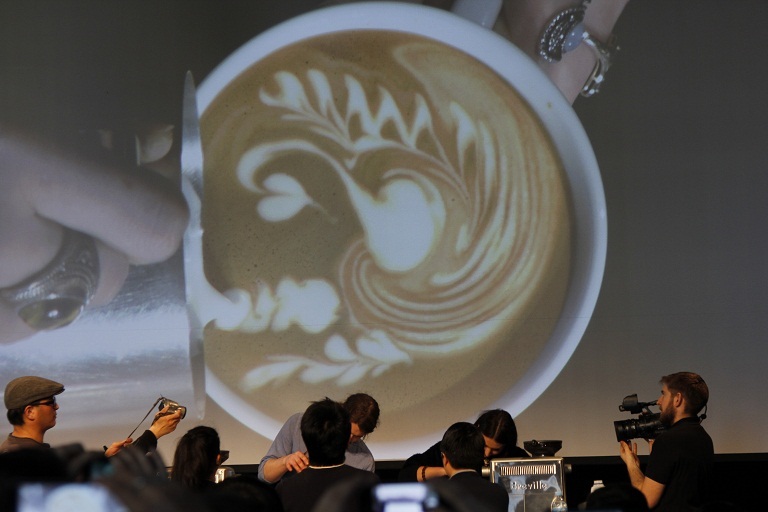 As a participant in the Breville Latte Art Smackdown, Jordan used the Breville Oracle® to battle it out with some of Sydney and Melbourne’s finest baristas, in front of a packed arena and cheering crowd in the Museum of Contemporary Art’s (Foundation Hall). Members of the audience were asked to spin the ‘Wheel of Death’ to determine the latte art style, which was then attempted by competitors. “I thought the Breville Smackdown was great. It was only the fourth competition I had ever entered but I believe it had the best format of all the others I have been to. The camera and big screen made a significant difference because it allowed the audience to be more included and it was great to hear their responses on our pouring. “I was really thrilled on how keen the audience was and although the stage and lights proved daunting to some of the baristas, I felt like it had a really fun vibe about it. I knew the calibre of the baristas would be really high so I entered the competition as a challenge to myself and didn't actually expect to do so well considering I was up against New South Wales and Victorian state champions. “Don't overheat your milk. You want to produce smooth, glossy milk and overheating will cause fine bubbles. Try to only have enough milk in the pitcher to fit into the cup you will be pouring into. If you have too much milk you won't be able to get the right pouring angle for your patterns.